CoreGuard Antivirus is a new fake security scanner (rogue). BleepingComputer CoreGuard Antivirus 2009 removal guide. VirusShield is a new fake security scanner (rogue). It belongs to the same family as Extra Antivirus, Virus Sweeper, Ultra Antivir 2009, Virusdoctor, VirusMelt, VirusAlarm. Virus Shield comes from fake online scanners. BleepingComputer Virus Shield removal guide. ErrorEasy is a rogue that belongs to the same family as ErrorFix, RegTool, RegfixPro. These fake tools are not detecting infected files or malwares but fake registry problems. Another rogue (ErrorRepairTool) shows a relationship between, PC Utility Inc. (the editor of these tools) and 2Squared.com (a known rogue editor). But PC Utility Inc. claims that their products are legit and there is no relationship with 2Squared.com. errorrepairtool.com (75.125.61.163) PC Utility Inc.
errorstool.com (75.125.61.163) PC Utility Inc. It was exactly the same page, but 2Squared Inc. was replaced by PC Utility Inc.
Looks like déja-vu, see RegistryFox Rogue (from another known rogue company: AntiSpyware LLC.). The Database is the same as AntiSpyware LLC. rogue. There is a hardcoded string of 2Squared.com in the PC Utility Inc. tool. Advanced Spyware Detector is a new rogue. It is also know under Advanced Spyware Detect or Advansed Spyware Detector (typo error in the binary tab version and registry keys). This fake security software detects false positives to justify an infection and scare users. It replace the desktop background with a fake security message. MalwareCleaner is a new rogue. This fake security software drops many fake executables on the system to justify an infection and scare users. ErrorFix, RegTool, RegfixPro are new rogues. They are from the same family and have the same GUI. These fake tools are not detecting infected files or malware but fake registry problems. Malwarebytes removal instructions for ErrorFix, RegTool, RegFix Pro. ExtraAntivirus is a new rogue. It is from the same family as AV Antispyware, PAntispyware09, MS Antispyware 2009, Pro Antispyware 2009, SysAntivirus 2009, WinSpywareProtect. It has the same name as another rogue but not from the same family. With so many rogues, it's not a surprise that two families have one day the same product name. PC Codec Pack is the new version of LuxeCodecXP, WinCoDecPRO. 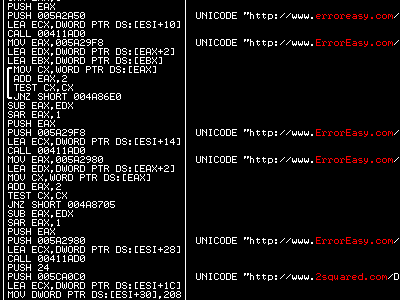 PCCodec Pack displays codec error, redirecting infected user to PCCodecPack web site. The Fake Alert binary use Lighty Compressor (seen on WinPC Antivirus dropper, and DNS.Changer dropper). ExtraAntivirus is a new rogue. It belongs to the same family as Virus Sweeper, Ultra Antivir 2009, Virusdoctor, VirusMelt, VirusAlarm. Extra Antivirus comes from fake online scanners. Extra Antivirus drops many files on the system with different filenames taken from a dictionary. These files are not Win32 executables and are detected as infections to scare users. AVAntispyware is a new rogue. It is from the same family as PAntispyware09, MS Antispyware 2009, Pro Antispyware 2009, SysAntivirus 2009, WinSpywareProtect. As always, detection of fake infections to scare users and a promise to remove all infected files/keys when activated for $49,95 (6 month license). WiniBlueSoft is a new fake antimalware. This rogue detects fake infections on a clean system and displays lots of warning messages to remove them. Many files are created on the system (with a random filename) to simulate an infection. Those files are not executable and filled with junk. WiniBlueSoft also display a fake Windows Security Center Window. HomeAntivirus 2009 is a new fake antivirus/antimalware software. This rogue saves files in the system (filled with junk) and detects them as infections to scare users. These files have a random filename, are not executable and are not infected. Home Antivirus 2009 displays alerts to be registered to remove those files. HomeAntivirus2009 replaces the original Windows Security Center by its own, and force the Control Panel to be displayed with the classic view. BleepingComputer Home Antivirus 2009 removal guide. Antivirus 2009 (aka Antivius'09, Antivirus09) is a fake security software (rogue). Once installed, Antivirus'09 will detects many inexistent infected files and displays alerts to be registered. PAntispyware09 is a new rogue. It is from the same family as MS Antispyware 2009, Pro Antispyware 2009, SysAntivirus 2009, WinSpywareProtect. Is Web Antispy going to be the next of these DIY Rogues ? At this time WebAntispy page is hosting TotalAntispyware Rogue. AntivirusPlus is another fake security software (rogue). This scareware is not new, but it was not very active. Recently, more fake online scanners advertise Antivirus Plus for removal tool. If the rogue detects a lot of infections (all inexistent), once registered, it propose to remove them. If we don't accept (ALT-F4 to quit) they have all disappeared on next execution. Virus Sweeper is a new rogue. It belongs to the same family as Ultra Antivir 2009, Virusdoctor, VirusMelt, VirusAlarm. The GUI is always the same, only the title name is changing. Note that 2 GUIs exist, one with a Vista skin, the other with a XP skin. As for the previous rogues of this family, the software is hosted on google code. Virus Sweeper comes from fake online scanners. Nonexistent files are detected on a clean system, installation of the software is proposed to users for a free scan. Virus Sweeper drops many files on the system with different filenames taken from a dictionary. These files are not Win32 executables and are detected as infections. A real malware modifies the desktop (desktop hijack) and promote the rogue with popups. Looking into the code, we can see that just after being registered, the rogue removes the malware and its restriction that prevent users to restore the original desktop background. Then it displays the "Register Success" Message box. This kind of Desktop Hijack is used to scare users. The evil code installs restrictions to prevent infected users to restore the original background picture. The message in the taskbar is from the malware and leads to Antivirus XP Pro 2009 fake security software (rogue) website. WinPC Antivirus is a Fake Security application. It replaces WinPC Defender. These rogues are from the same creators of XP Police Antivirus, IE-Security, WinDefender 2009 and Total Secure 2009. Once registered, all the fake malwares detected are now missing. And it looks like designers forgot to remove a part of the GUI Skin. (Click on the Help & Support button redirects to win-pc-defender Website).